Enjoy the unique creations born in the imagination of some of Humboldt’s most talented Artists by visiting a local Art Gallery. Taking home an original piece of art will provide a lifetime of reflection and memories and who knows, maybe your next favorite Artist will be from Humboldt. 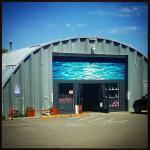 We’ve put together a list of Humboldt Art Galleries below. Just click on each to get photos, directions and more information. Are we missing your favorite Humboldt County Art Gallery? Please let us know so we can share it with other site users looking to view the diverse work that can be found throughout the area.